The technique works as described, but I've encountered a problem when using the auto-correct technique immediately after closing quotes or closing parenthesis. In short the auto-correct insertion doesn't work when immediately following these other symbols. Is there a way to change the auto-correct behavior so it works in these situations or has anyone created an alternative keystroke sequence, like in MS Word, where you can use Ctrl + Shift + - (number pad minus sign) to insert an em dash whenever and wherever you want? The AutoCorrect feature replacing two hyphens with an em-dash is OK. However, it does have some disadvantages. For various reasons, some writers and editors - even in the Anglo-Saxon world - prefer adding a single space before and after the em-dash (and not only in the case of en-dash), but the AutoCorrect function works only if spaces are not added. Moreover, I cannot add an em-dash at the end of a line with the double-hyphen method. Take a look at Laurence Sterne's Tristram Shandy to see all kinds of functions that a dahs may have in creative writing. Or Emily Dickinson's poetry, for that matter (the modern critical edition, in which the manuscripts' idiosyncratic typography has been preserved, as it should be). Sorry, but autocorrect is just not acceptable. Writers and editors need to be able to use key combinations to produce the characters they want -- and only when they want them. Auto-anything is both too clunky and too vulnerable to mistaken "corrections." There are pages and pages of argument on the OpenOffice forums about how to get real curved quotes and em dashes, but most replies don't understand that no serious user is going to stop to enter Unicode (using multiple keystrokes inthe process) and if there's a solution to how to get these marks with simple key combos, the answer is buried too far into the thread for anyone to find it. Can't anyone come up with a solution? I must SHOUT loud and clear that using auto-correct is just not acceptable to use special characters such as the em and en dashes! Serious writers and editors need to be able to use KEY COMBINATIONS to instantly produce the special characters they need. "Auto"-anything (or Insert>Special Characters>then hunt-and-peck for the special characters you want to use)is way too s-l-o-w and involved! Also, no serious writer/editor will take the time to stop to enter Unicode (using multiple keystrokes in the process to access these special characters). 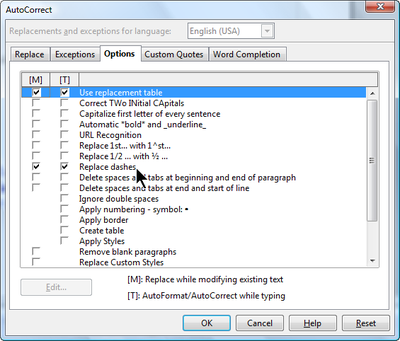 For example, MS Word, where you can use Ctrl + Shift + - to insert an em-dash whenever and wherever you want. Why can't this be used in OOo? We have some of the best minds on the Internet using OOo. Can't anyone come up with a viable solution? Perhaps this can be fixed in the next update of OOo? I agree with the other comments -- I want a way to insert em-dashes using a simple key stroke! 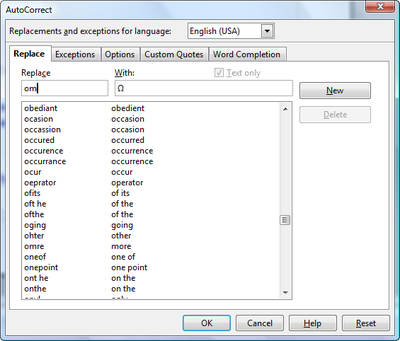 In Word, I had assigned the keystroke to CTRL + D, and I am struggling with how to do that effectively in OOo. 7) Click on "modify", and "OK"
It only looks like a lot of steps because I have spelled out every detail: it is really very easy. In any application that you use a lot, it is worth learning how to create and use macros: you can have a single keystroke perform very complex tasks for you, which can save you a lot of time; or, as in this example, a macro can be as simple as the insertion of a single character. This is awful. I hate auto-correct. What is the manual procedure? 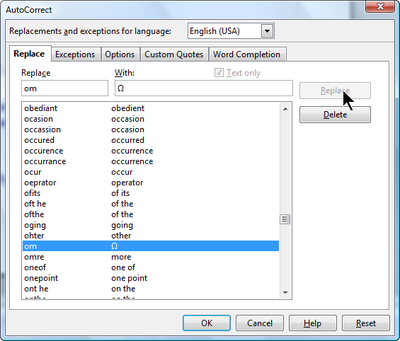 You can insert the em dash under Insert > Special Characters; it's in the General Punctuation section. I've added a screen shot to the blog.